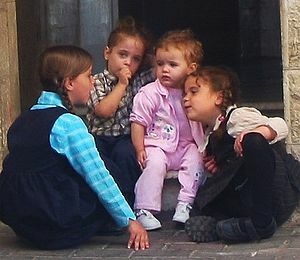 In response to a question on Imamother: Do mothers of many children have more nachas? Mothers of many children have more. More crying, and more giggling. More complaining, and more warm sleepy bodies curled up against you for a bedtime story. More shouting, and more whimsical childhood secrets whispered ticklishly in your ear. More sibling rivalry, and more siblings performing original plays for Mommy on a Shabbos afternoon. More nights you stay awake balancing a baby on each hip, dancing them to sleep as music plays, bleary eyed while you damage your feet so permanently that you will have to wear custom insoles for the rest of your life. And more nights in your life that you held close those you love most and danced. There are more teenagers to gang up in protest against your ridiculous rules. And more teenagers to arrive home on the day of your own mother’s yahrtzeit, and when you protest tearfully that they didn’t have to come, they say we’re with you. Mommy, we’re with you. So much more mess, but when you stack it all up before your Night of Freedom, it becomes a pile of so many first grade copies of Chumash Bereishis, each child an opportunity to begin anew, so many priceless works of art that reinvent the artist.